JAPAN: Dumped CRT TVs pile up as this weekend's digital switchover approaches | What Hi-Fi? We've covered in past reports the unexpected upswing in demand for new TVs in Japan as this weekend's switchover to all-digital broadcasting approaches. But now there's the problem of getting rid of all the CRT TVs and early flatscreen models unable to be adapted to digital operation. 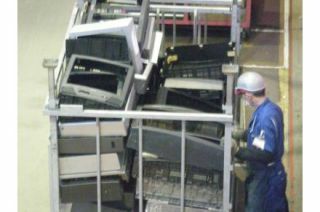 And there's quite a lot of them: it's estimated Japanese consumers will junk some 22m CRT TVs this year, which is giving TV manufacturers something of a headache. After all, under Japanese environmental law, those manufacturers are obliged to recycle all those sets. The pile-up could have been worse – following the March earthquake and tsunami, the digital switchover has been delayed in those prefectures affected by the disaster, namely Miyagi, Iwate and Fukushima, as part of the recovery process – but that still leaves a huge number of sets to be recycled. Panasonic's Eco Technology Centre in Hyogo prefecture, which I visited earlier this year, is running at near its full capacity of 3000 sets a day, and is looking at ways of boosting the number of TVs it can disassemble and reprocess. However, there are problems with all the waste being generated. As I explained back in March, the PETEC plant uses laser technology to separate the two kinds of glass used in TV tubes – that used for the screen itself and the lead-heavy material in the 'funnel' of the tube. But while the 'front' glass can be recycled into bottles, paving materials and other glass products, the amount of lead in the 'funnel' really only makes it suitable for making – well, more CRT TV tubes. To date, much of this glass has been exported for reuse to other countries where CRT TVs are still being made, but there's now a worry that the huge numbers of TVs now being recycled in Japan will now overwhelm even this source of demand. Add to that the fact that Japanese manufacturers are required to ensure such scrap glass exports are recycled properly, and you can see the scale of the problem. However, it's not just old CRT TVs creating a headache for Japan's consumer electronics companies. Older flat-panel TVs incompatible with terrestrial digital broadcasting can be even more of a problem, as the composition of the glass used by various manufacturers in the past, and the way they were produced, makes recycling more complex than just cutting a TV tube into two kinds of material. Researchers in Japan are working on ways of recovering some of the rare earth metals used in these screens, but the technology for recycling flat-panel TV glass is underdeveloped, meaning there are only limited uses for the waste glass. Looks like more plants as advanced as Panasonic's will be needed, and fast. By the way, there's another consumer electronics demand-spike going on in Japan at the moment: Blu-ray recorders are flying off the shelves as consumers get ready to record the new digital broadcasts. Sales in June were up 130% on the same month last year, while the first three weeks of this month saw sales almost 190% up year-on-year. As with TVs, that's leading to shortages of product, not helped by plummeting prices as retailers compete to make the most of the buying boom: some models have dropped by as much as 40% in the past two months. Blu-ray recorders now account for over 90% of all standalone Blu-ray hardware sales in Japan.